I’ve been a Netflix user for many years. I was intrigued when they began offering some of their movies in streaming format directly from their web site — I think it’s easy to see that this is the future of entertainment content distribution — but I’m personally not a fan of sitting in front of my computer to watch long videos. One of these days I’ll get around to either building my own HTPC, or upgrading our TiVo, but in the meantime, Santa brought a fancy new gadget that bridges the gap quite nicely. 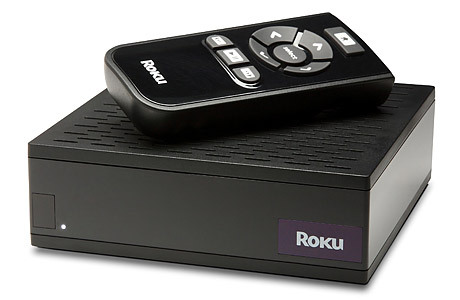 It’s called a Roku and it started life as nothing more than a set-top box that allowed streaming of Netflix content. It works with either a wired or wireless internet connection, and automatically adjusts the video quality based on the connection speed that is available, but even over wireless a high quality picture is possible (even HD). This latest incarnation of the device has expanded the number of sources from which streaming content is available. Netflix is joined by several other providers, including Amazon’s Video on Demand service, as well as Major League Baseball. There are several other lesser-known providers available in the Roku “Channel Store” that one can subscribe to, including one of my favorites (that I already subscribe to through TiVo) Revision3. The only gripe I have with the box is that I wish it allowed you to point at any internet-based content source, perhaps by entering an RSS feed, or something similar. Maybe this will be offered in a future version of the firmware. Apart from that, I’ve been very happy with the ease of the initial configuration (and the linking to my Netflix account) and the quality of the video streams. I also like that if you have to stop a movie in the middle, it remembers your place so you can resume watching later. If you are already a Netflix subscriber, there are few reasons not to buy this box and bring the mailbox shuffle to an end. Shipping movies by mail is soooo last decade.